Yes, Tallulah Bankhead performed at my alma mater in 1940. Tallulah Bankhead wasn’t your typical Southern Belle. Born in Huntsville, AL, Bankhead’s father was William B. Bankhead-a politician from Alabama and Representative from 1917 to 1940. But despite her prominent background, Bankhead has been described as flamboyant, wild and dabbled in alcohol and drugs such as cocaine and marijuana. She left her Southern roots at the age of 15 to travel to New York to become an actress and made her stage debut in 1918. She later was in Hollywood films starting in the 1930s. After acting in films alongside Gary Cooper, Robert Montgomery and Charles Laughton, Bankhead made her way back to her southern roots. Based in the early 20th century in the South, Regina manipulates her daughter and estranged husband to work out a business deal with her unscrupulous cousins. 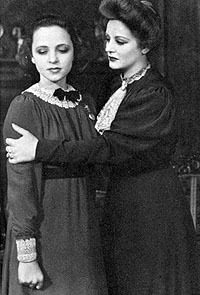 Later made into a 1941 film starring Bette Davis, “The Little Foxes” ran for 410 performances at the National Theatre on Broadway. 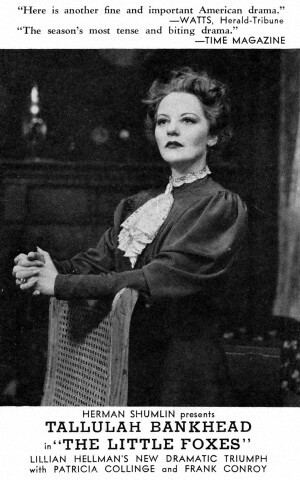 “The Little Foxes” brought Bankhead to Rock Hill, SC. On March 4, 1940, she performed her role of Regina Giddens on the stage of the brand new Byrnes Auditorium of Winthrop College (now Winthrop University) which was an all-girls school until 1975. Bankhead had ties to York County. Her great-great-grandfather George Bankhead moved to lived in Bullock’s Creek, York County South Carolina before moving to Alabama in 1830, according to Lee and Wes’s book. “As a (local) reporter asked the Hollywood actress about her fast-paced life in California, Bankhead…reminded the journalist, ‘Dahling, I’m from Bullock’s Creek,’” Lee and Wes wrote. Though Bankhead was not in the film adaptation of the play, her Broadway costars Dan Duryea, Charles Dingle, Carl Benton Reid, and Patricia Collinge starred with Bette Davis. Knowing that Tallulah Bankhead once walked on a campus where I studied journalism, makes me feel just a little closer to the Golden Era of Hollywood. This entry was posted in Classics in the Carolinas and tagged Little Foxes, Tallulah Bankhead, Winthrop University by Jnpickens. Bookmark the permalink. Jessica – as a big Tallulah fan, I too would feel a connection with Old Hollywood if I’d known “Tallu” had performed one of her better roles at my college!